There are several requirements to being a Cat Lady. 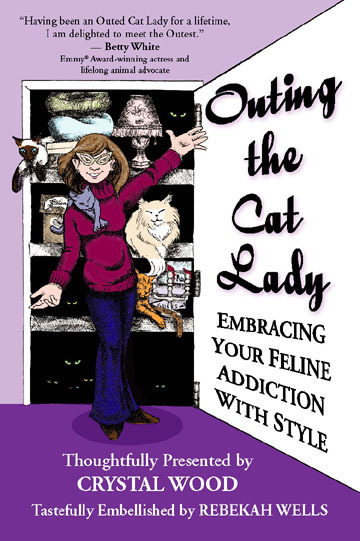 Crystal Wood catalogs them in her delightful book, Outing the Cat Lady, and gives you insight on why any of them would potentially make you a Cat Lady. "In this book I have identified nine characteristics of the contemporary, cosmopolitan Cat Lady, which are thoughtfully listed below. If you can identify with only one of them, you are merely teetering in the brink of being a Cat Lady; but if you can tick all nine, you are definitely a Cat Lady, and now is the time to come Out with style." You will know it is time to come out when you have read and reflected on the author’s very astute observations as a well-known Cat Lady of the first ilk. My fear is that if I list the requirements, according to “cat-hoyle”, I will spoil it for you. This is a book that you can't miss, whether you are a cat-aholic or not. It is a tongue in cheek look at the love of all things "cat". From acquiring your cats (buying or adopting, whichever is your pleasure) to your personal romantic habits with the proverbial curious feline looking on, this book is a wealth of information to help you cope or at least accept. The artistic endeavors in this book are very well done by Rebekah Wells. The illustrations are not only funny, but so very descriptive of living with a congregation of curious and entertaining felines. With this being said, as a Dog Lady, but also a liker of cats, I am of the opinion that much of what has been said by Ms. Wood can be applied to the canine species (and possibly to other domesticated and semi-domesticated animals). Crystal Wood lives in Denton, Texas with her husband and a herd of cats of uncertain lineage. She and her husband work with Texas Siamese Rescue (www.tx.siameserescue.org) transporting felines all over the United States and Canada, even all the way the Scotland. She is also the author of two well-received novels, Cut Him out in Little Stars and Fool's Joust. Her "real" job is as a freelance graphics artist and production designer. Rebekah Wells lives with her husband in Litchfield, Staffordshire, England. When not working on her wonderful drawings, she can be found roaming the countryside, with her husband, exploring abandoned abbeys and crumbling castles, visiting celestial cathedrals and magnificent manor houses to feed her passion for history.